Xero only pulls in customers from the Xero contact list, not just contacts. In order for a contact to become a "customer" in Xero, it will need to have an invoice associated with it. If this is the first time a customer has been used in Xero, you can create a fake invoice for that customer, void it out, and then re-sync your connection to Xero in Expensify in order to then pull in this new "customer". Fill out the few required pieces of information, save the invoice, and then go ahead and void it. Click Invoice Options > Void. Your customer will now show up as a customer. 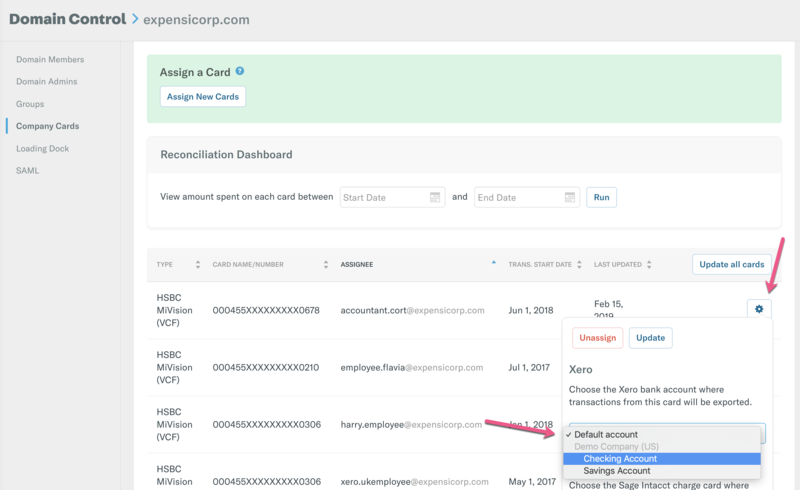 Re-sync your Xero connection in Expensify and you should then see the customers appear in your tag list. 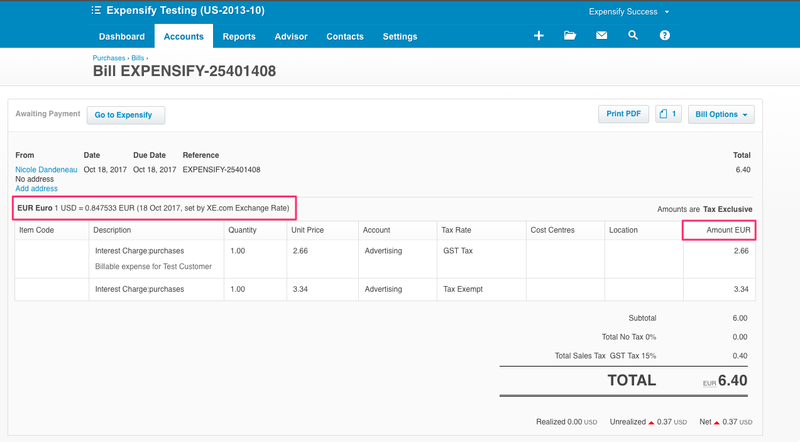 Where the merchant in Expensify is an exact match to a contact you have set up in Xero then exported credit card expenses will show the vendor name. If not we use the the default name Expensify Credit Card Misc. This is done to prevent multiple variations of the same contact (e.g. Starbucks and Starbucks #1234 as is often seen in credit card statements) being created in Xero. 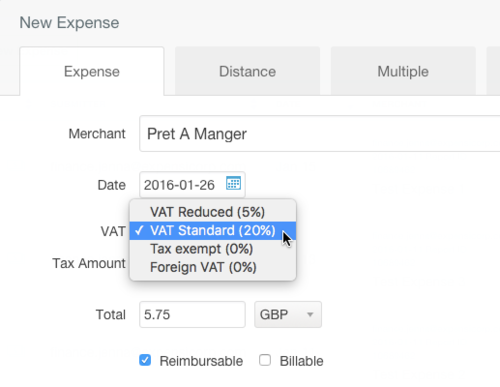 To change merchant names to match your vendor list in Xero, we recommend using our Expense Rules feature. More information on this can be found here. First, if your categories are showing up correctly in the policy editor in Expensify, then you will need to make sure that they are not disabled. If they are disabled, your employees will not be able to use these categories in Expensify. So, just enable all of the categories that you want your employees to use. Second, make sure your expense categories have actually been imported from Xero, and have not been manually created in Expensify. 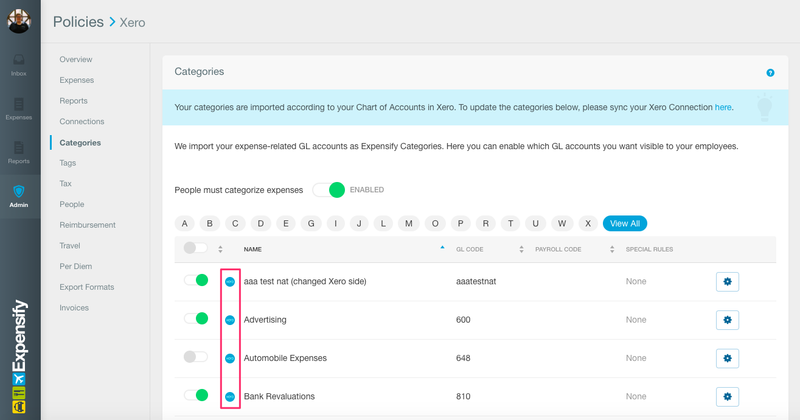 In the example below, the category with the Xero icon has been imported from Xero, while the category without the Xero icon has not been imported from Xero, and should be disabled (as using it will prevent a report from exporting). 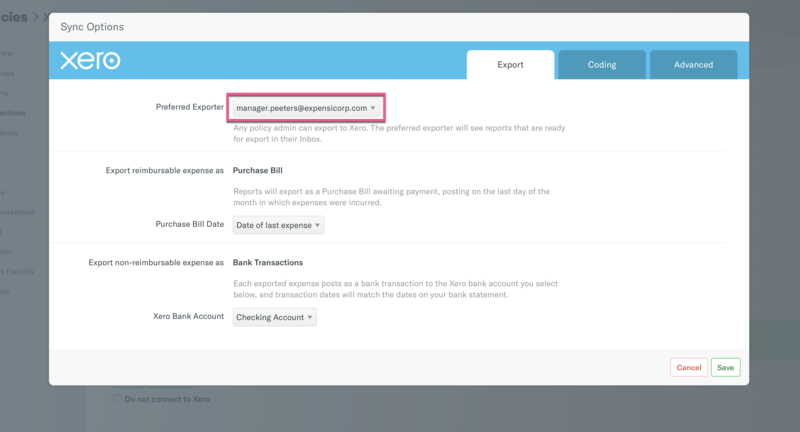 Third, to display a Xero category in Expensify, it will need to be an Expense accounttype, or have Show in Expense Claims enabled prior to syncing your Xero connection in Expensify. 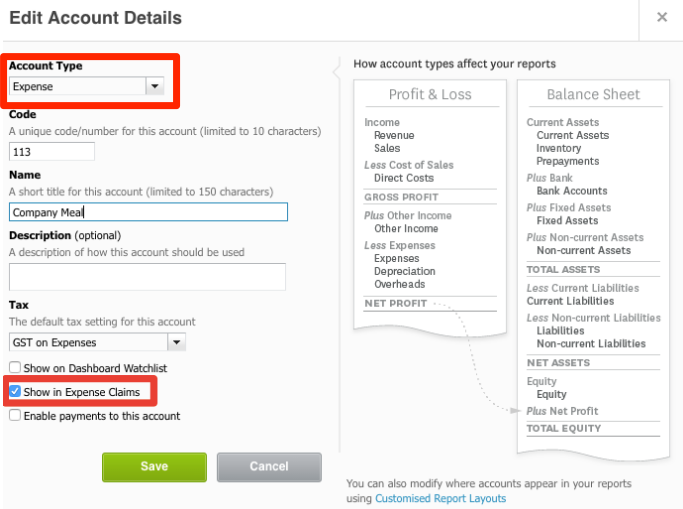 Even if you have mapped your cards to individual GL accounts in Domain Control, you still need to select the make sure you have selected an account for all other Non-Reimbursable transactions, as well as to define the "default" from Settings > Policies > [Policy Name]> Connections > Configure. If your reports are being exported automatically by Concierge, the user listed as the Preferred Exporter under Settings > Policies > [Policy Name] > Connections > Configure must be a domain admin as well. 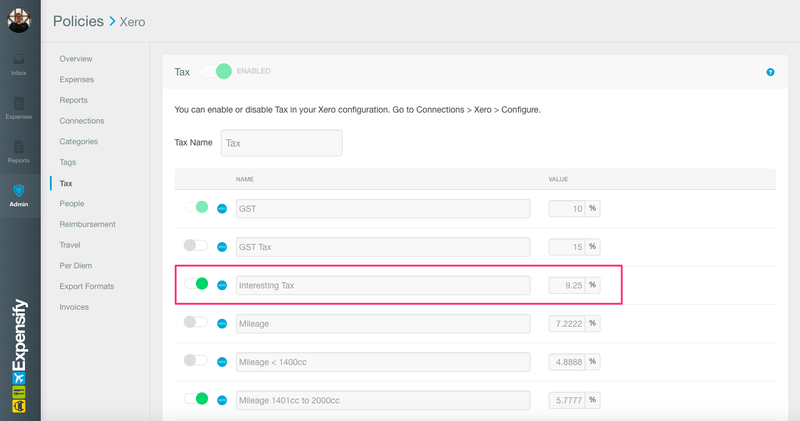 If the report exporter is not a domain admin, all company card expenses will export to the default account selected in the Non-Reimbursable section of your Export configuration settings under Settings > Policies > [Policy Name] > Connections > Configure. When using multi-currency in Xero and exporting reimbursable expenses, the bill will use the output currency in your Expensify policy, as long as it is enabled in Xero. 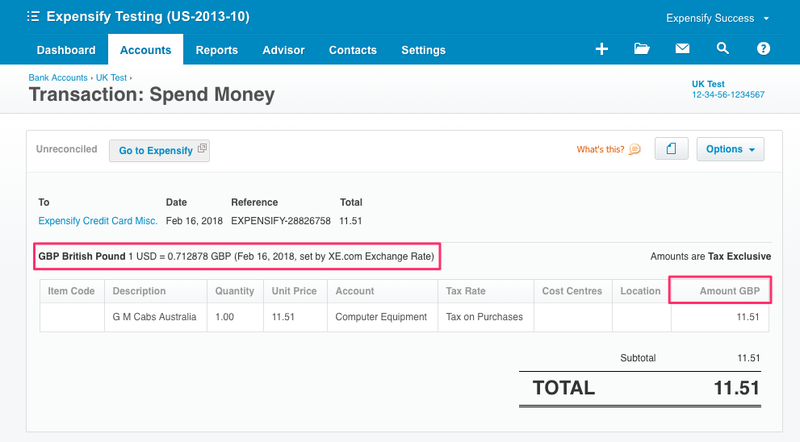 Your general ledger reports will convert to the home currency in Xero using currency exchange rates, as set in Xero. 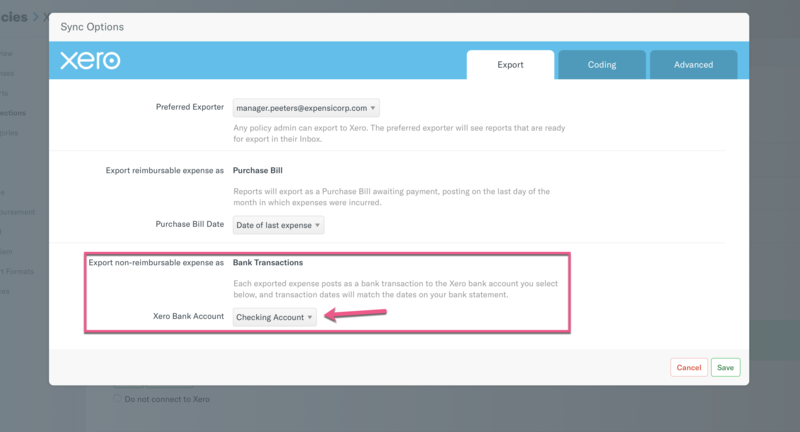 For non-reimbursable expenses, the bank transactions will use the currency on the bank account in Xero, regardless of the currency in Expensify. If these currencies do not match, we use a 1:1 exchange rate, so make sure the output currency in Expensify matches the currency on the bank account in Xero. The Tax Name field and the rate listed under Tax on Purchase Items are imported into Expensify under Settings > Policies > [Policy Name] > Tax. With reimbursable expense reports, the total of the report needs to be positive in order to export to Xero successfully. Individual reimbursable expenses can be negative as long as the total of the report itself is positive. Negative non-reimbursableexpenses will export without issue, even if the total of the report is negative. 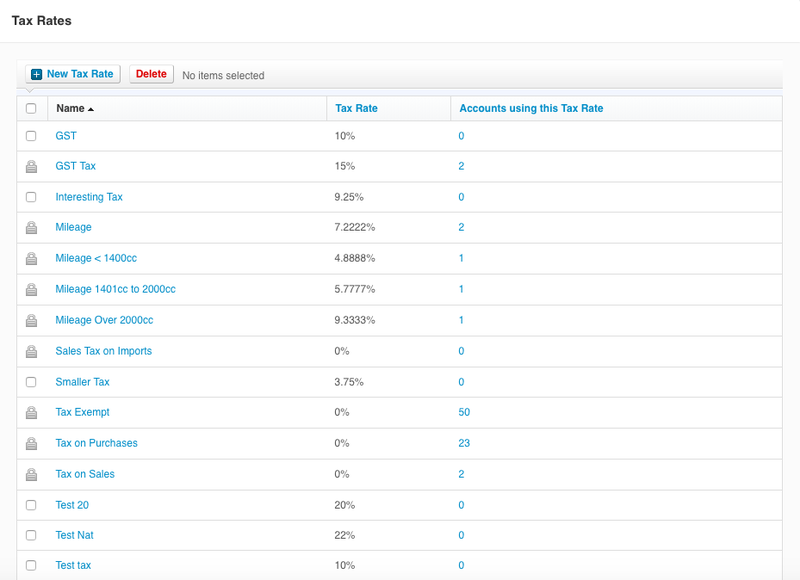 When exporting to Xero, each expense has to have a category selected. The selected category has to be imported in from Xero and cannot be manually created within the policy settings. Reports will export to Xero based upon the settings you have configured in the Connections area of the policy settings. You can learn more about how to configure this connection here.